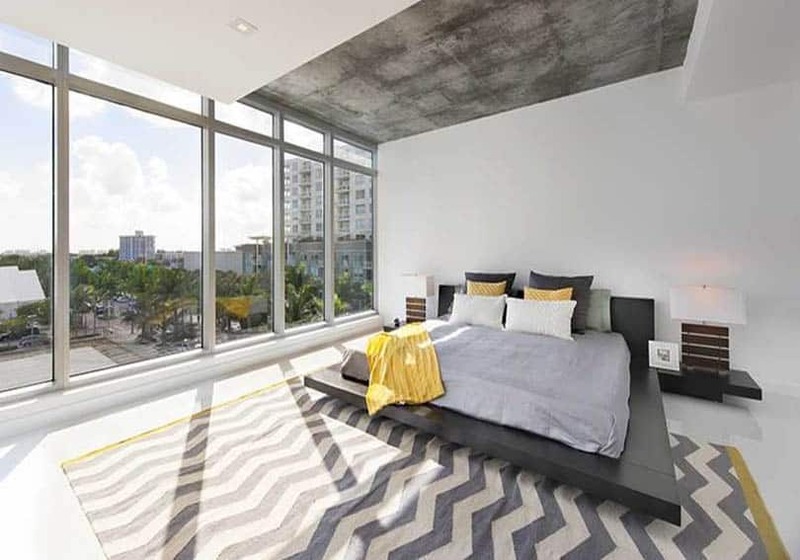 This gallery offers stylish gray & yellow bedroom designs in a variety of styles and decor. Gray is one of the most popular and well-used neutral color. This color combination has even gained further popularity in the past few years as recent design styles and trends has a penchant for using grays. It is well-lauded for its flexibility, making it a safe color of choice, no matter what style you are trying to achieve. However, gray can be a little sombre or boring, especially when you don’t use an accent color. Yellow, on the other hand, has a bright, positive and youthful energy to it, but tends to be a bit overwhelming when used in large surfaces or large quantities. The calm & cool gray, combined with the loud & bright yellow, tend to neutralize the negative qualities of each color, and produce results which has the best of both worlds — the calm & elegant quality of gray, and the fun & refreshing vibe of yellow. Gray and Yellow have many different shades, and depending on your combination, it produces different looks and ambiance. 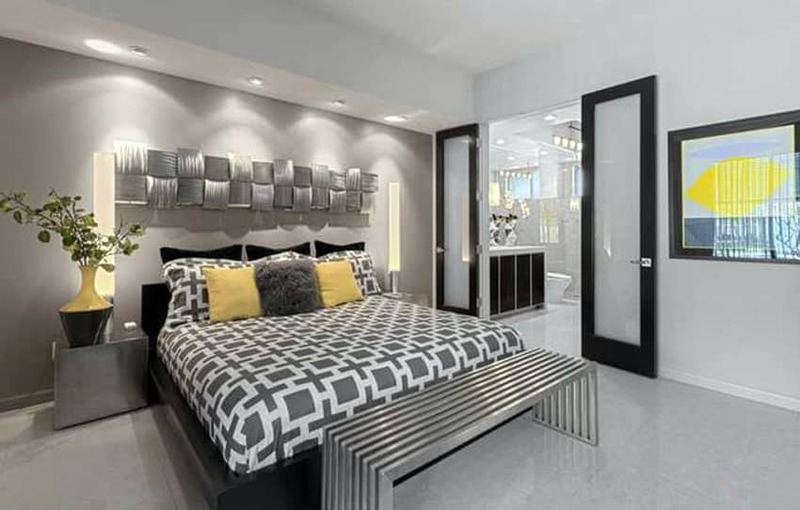 You must always keep in mind the style and look you are trying to achieve before deciding among the many different shades of gray and yellow. There are many popular design styles nowadays, and although they tend to be a more playful and experimental with their approach, certain shades of yellow and gray match better with certain styles and work hand-in-hand with the other colors and finishes to achieve a specific ambiance. Contemporary / Transitional Styles – these styles are usually used to describe contemporary spaces which uses a few classic furniture pieces or draws inspiration from traditional styles and recreates them to give a more updated look. For these types of spaces, it is best to avoid loud colors and keep it toned down. For grays, dove gray and charcoal gray would work well with the style. You can play around with different materials and textures to use it on, to give your design more depth and tactile aesthetic. The yellows would need to be more subdued and less loud if you want a more elegant feel. Mustard is a great shade of yellow you can use for such purposes, as it has a more subdued feel while retaining a somehow playful vibe. Gold in the form of metals, trims, satin and silk fabrics would also produce great results for contemporary spaces. You can use gold on small items such as picture frames, tassels, sculptures, pillow embroider and other subtle accessories. Zen interiors – these types of designs are often boxy, angular and very symmetrical, using high contrast combination of finishes such as white and dark wengue. Because most of the warm tones would already be found on its wood elements, it is best to use cooler-toned grays such as arctic ice, slate gray, silver and other similar colors, to add more contrast to the colors. Meanwhile, you can use bright yellows such as lemon zest, bumblebee and Tuscany yellow in small quantities to add a bright fun accent, or use subtler shades such as daffodil, cream and French vanilla if you want to apply it in larger areas. Minimalist interiors – minimalist are often very linear, clean and functional, with as little unnecessary items/decor as possible. White is usually the wall color of choice for this style, but dove gray is also often found as a wall color or an accent wall color. 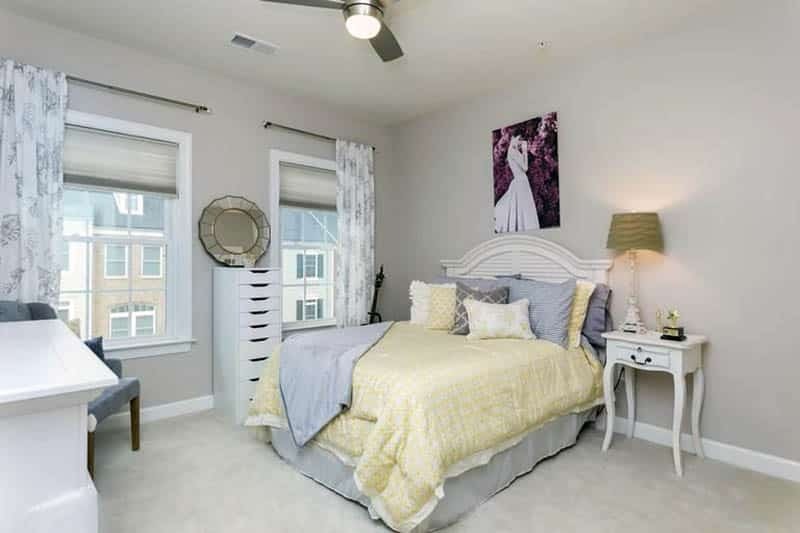 Cool-toned grays often work well with minimalist bedrooms. Lighter shades such as dove gray, smoke and silver are often used on larger areas like walls, floors or bedsheets, while darker shades are usually only used as accents and pattern colors. Since accessories are very minimal, you only have a few options where to inject yellow. Pillows, print pattern, trims and throws are the most common yellow items in minimalist interiors. 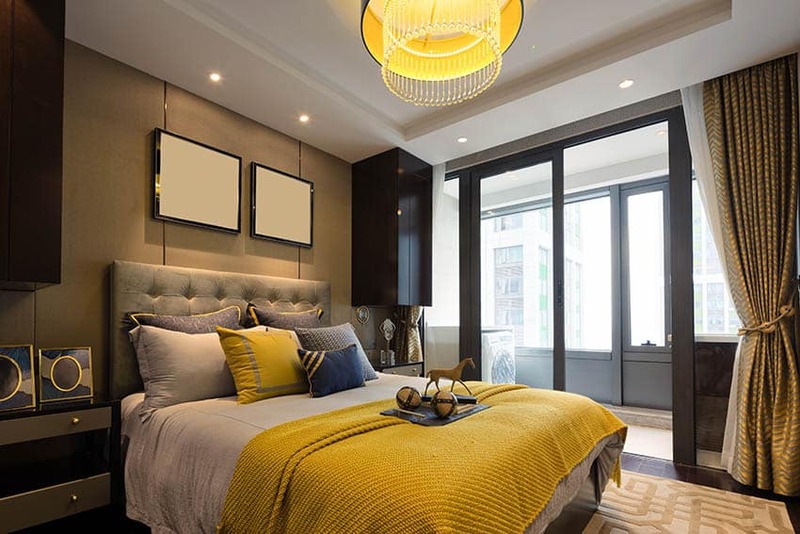 You can, however, use any shade of yellow you prefer, as minimalist bedrooms often have a very neutral-colored base, giving you more leeway to play with accent colors. Industrial Style Interiors – Industrial spaces tend to look a bit raw, rugged and masculine. Gray is definitely the go-to color for industrial spaces, as it is often found on elements such as raw concrete or sheet metal, both widely used for industrial style interiors. Industrial spaces also tend to lean towards monochromes, simply playing with different shades of grays and whites, so a touch of yellow would instantly give life to the space. Yellows such as lemon, golden yellow, mustard and Scotchbutter would often be found on a few accent pieces such as throws, pillows, trims, fabric prints and other small accessories. 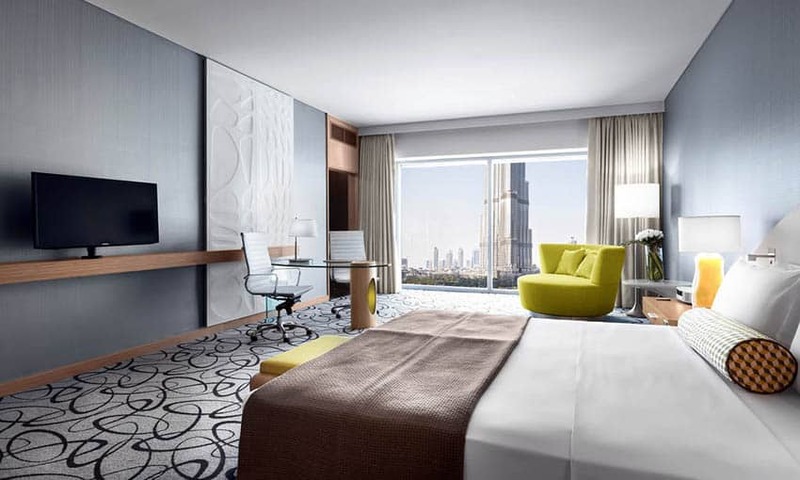 Modern Designs – modern interiors, particularly styles from or inspired by the modern period (roughly 1860 to 1970’s), tend to be a bit more bold and playful, and in such styles, we can see a more liberal use of yellows. Bright bold yellows, creams, mustards are used uninhibitedly on walls, patterns and prints. 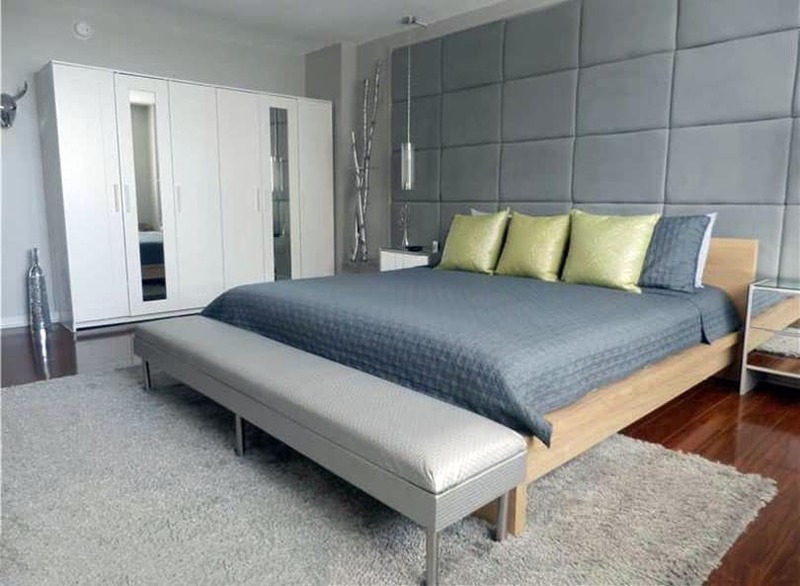 Gray is also often seen modern style bedrooms, and are commonly seen on metal elements such as stainless steel furniture, lamps and other accessories. Play with textures – use materials with different tactile qualities. Experiment with velvets, linen, cotton, suede, or metallics such as gold chrome, satin, silk and bronze. Try combining glossy finishes and textures with “rougher” matte finishes. This will create more depth give your design a more tactile appeal. Experiment with patterns – patterns shouldn’t always be limited to fabric patterns/prints. You can also inject patterns on the way you layout finishes, like the accent yellow suede padded paneling above which were divided into vertical panels of different widths, giving the illusion of a higher ceiling. The tufting on the headboard is also another example of a pattern, as well as the consistent “border” design found on both the bed sheet set and the nightstands. Combine different shades – don’t be limited to 1 shade of yellow, white and gray, you can also add more variety such as cream, light taupe, charcoal gray, etc, and even wood finishes to the mix. Additional colors, such as black, can also be added into the mix sparingly. The market abounds with many decor in grays and yellows, although yellow is usually a bit more difficult to find than gray decor, however, due to yellow’s recently popularity, especially in shades like Mustard, you can now find more decorative pieces in yellow more easily. 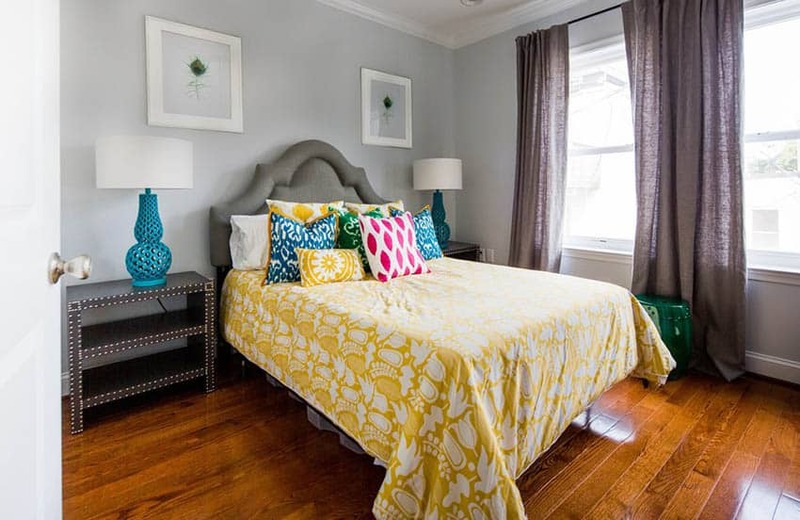 Bold Prints – The easiest and cheapest way to inject grays & yellows in your existing bedroom design, is through the bedsheets and pillowcases. If you already have a gray wall, or a gray upholstered bed like this example, you can try to have a bit more fun with your bedsheets by using a unique bedsheet pattern, in combination with fun & brightly-colored accent pillows. 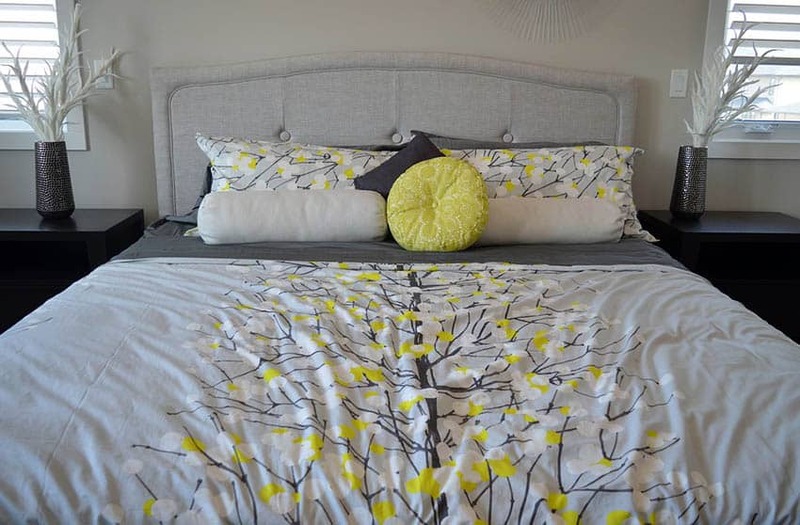 Minimalist prints – if you don’t feel like using too much patterns on your bed sheets, you can find bed sheet cover sets like this example, which has a simpler design and uses yellow in a more subtle way. The bright yellows are only found in small quantities for this design, but due to its light gray backdrop, the yellow stands out better. Furniture pieces – you can also apply yellow and gray to bigger items such as furniture upholstery or paint. This is especially applicable to minimalist interiors, which doesn’t really have much accessories where you can place yellows. 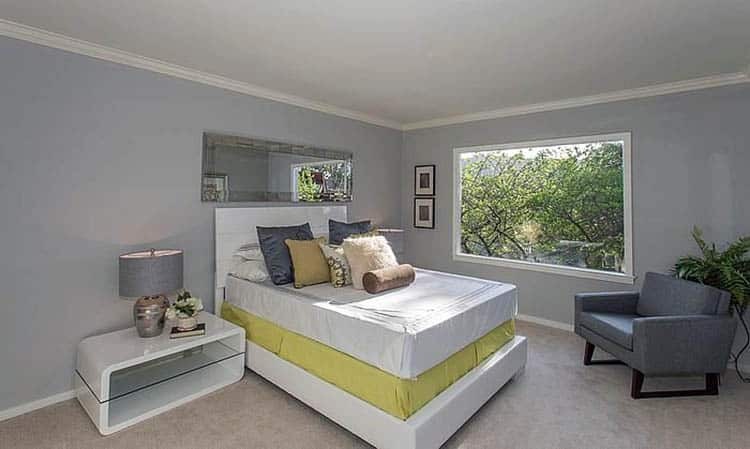 Above is a great example of a modern minimalist bedroom that uses a low platform bed upholstered in lemon yellow fabric, instantly making it the focal point of the neutral-toned bedroom. Using gray as you upholstery material color makes it easy to mix and match with other colors, therefore making its style more timeless, even when the season’s popular color changes. The silver satin upholstered bench above is a very simple furniture piece that can easily look good when combined with yellow or any other accent color. 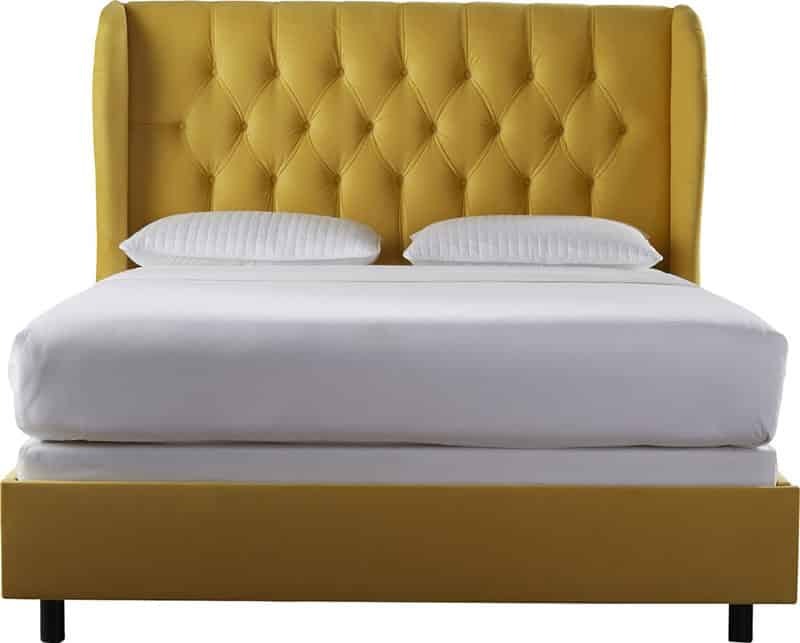 If you’re not afraid to grab attention and make a statement, then use yellows on big pieces such as this wingback panel bed. You can use more neutral-colored bed sheets (like white or gray) to tone down the boldness of the yellow. Also be careful with the selection of yellow shades to pair with the bedframe, as not all shades of yellow look good together. In this example, the space is dominantly gray including decorative pieces such as accent pillows, night lamps and even the accent chair. Yellow was subtly injected into the design by using it as the cover of the bed box and on the very subtle golden yellow pillows. Small furniture pieces – If you feel like you can’t commit to a bold and bright yellow bed frame, then, using smaller furniture pieces such as this yellow-upholstered bench is a good way to inject yellow into the bedroom design. This way, you won’t have to feel the need to keep on updating or changing your color scheme every season. This will also work if you use a yellow-painted desk chair or table in the design. Area rugs – carpets or area rugs is also an easy way to decorate your bedroom. Both modern patterns and more traditional styles are available in yellow, gray and yellow/gray, making it easy to find one. Also, an area rug can be easily changed. If you decide to change the color scheme later, or use a different design/pattern, you can easily roll your old area rug and replace it with your preferred rug. Plants & Flowers – yellow is a color that is easily found in nature. Instead of manufactured goods and accessories, how about experimenting with the use of yellow flowers in you decor? Metals – chrome gold , antique gold and bronze finishes have gained popularity these recent years, so you can easily find small items & accessories in gold finish, such as mirrors, frames, lamps and sculptures. 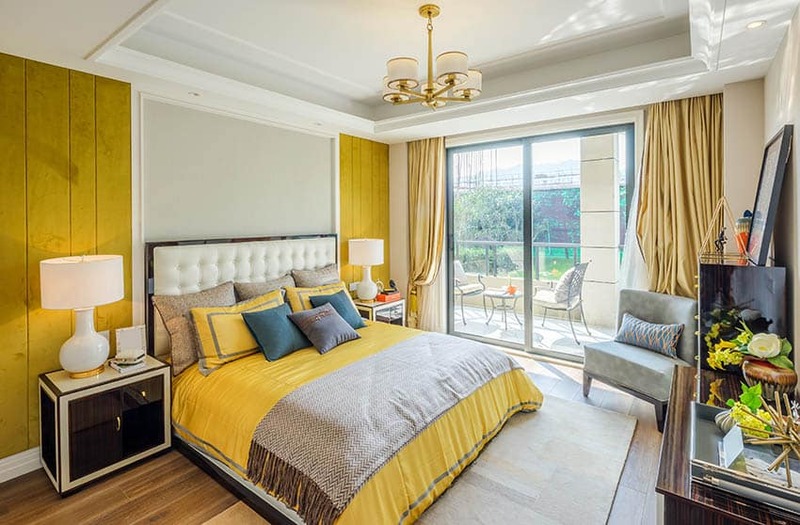 Note how this contemporary bedroom design uses yellow on very select pieces in the neutral-toned bedroom, giving it more personality and a refreshing feel to it. 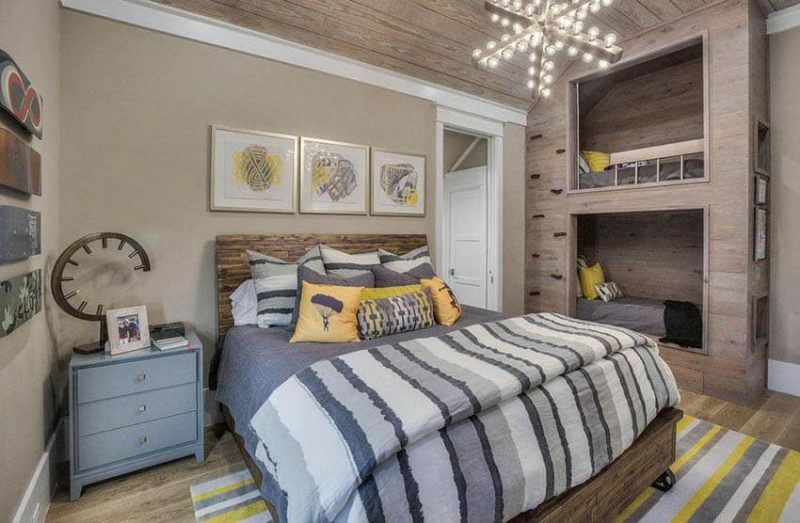 Using yellow, especially and gray for your bedroom interiors could sound daunting at first, but with the right shades and balance of colors, you can easily create a youthful gray & yellow bedroom design without making your eyes hurt with the overuse of the accent color. The combination of these two colors works well with any design style, but brighter yellow looks best in more contemporary designs.